Add a soft glow to every room with the newest idea in mood lighting . .
the Lo-Lites. An intriguing decoration .. a great gift idea, too. A unique design in transparent smoke-color Lucite® plastic. Bulb included. with acrylic dome shade. Bulb incl. chrome plated column. Bulb included. globe riding on a black-enameled metal cube. Globe 6-in. in diameter. 21 N3059-10 inches high. Shipping weight 3 pounds 4 ounces... . ... . . . .. This graceful glass column is a modem version of the French oil lamp. 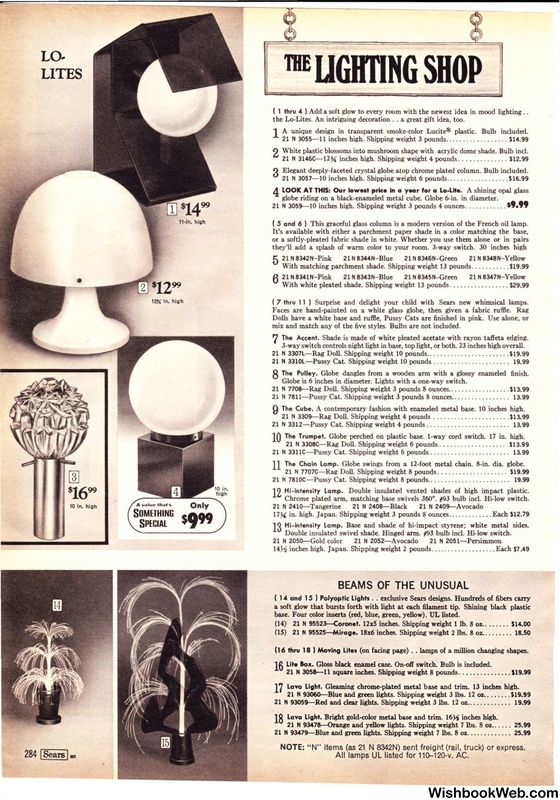 ( 7 thru 11 ) Surprise and delight your child with Sears new whimsical lamps. mix and match any of the five styles. Bulbs are not included. The Accent. Shade is made of white pleated acetate with rayon taffeta edging. 3-way switch controls night light in base, top light, or both. 23 inches high overall. The Pulley. Globe dangles from a wooden arm with a glossy enameled finish. Globe is 6 inches in diameter. Lights with a one-way switch. The Cube. A contemporary fashion with enameled metal base. 10 inches high. The Trumpet. Globe perched on plastic base. 1-way cord switch. 17 in. high. a 12-foot metal chain. 8-in. dia. globe. Hi-intensity Lamp. Double insulated vented shades of high impact plastic. Chrome plated arm, matching base swivels 360°. #93 bulb incl. Hi-low switch. Hi-intensity Lamp. Base and shade of hi-impact styrene; white metal sides. Double insulated swivel shade. Hinged arm. #93 bulb incl. Hi-low switch. (red, blue, green, yellow). UL listed. Gloss black enamel case. On-off switch. Bulb is included. Lava Light. Gleaming chrome-plated metal base and trim. 13 inches high. NOTE: "N" items (as 21 N 8342N) sent freight (rail, t ruck) or express. All lamps UL listed for 110-120-v. AC.